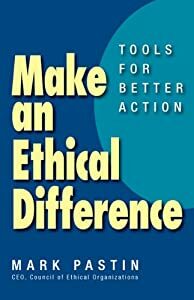 The attached video explains the main themes of Mark Pastin’s new book Make an Ethical Difference. One novel theme of the book is that individuals have an innate ability to make ethical judgments. Pastin calls this ability the “ethics eye.” More on this topic in coming posts as the main themes of Make an Ethical Difference are previewed.